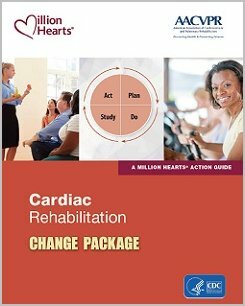 The Million Hearts® Cardiac Rehabilitation Change Package is now live! This resource presents a listing of process improvements that quality improvement teams from hospitals and cardiac rehabilitation (CR) programs can implement to improve CR referral, enrollment, and participation rates. These systems and strategies are organized into change concepts and change ideas with evidence- or practice-based tools and resources that can easily be adapted by or adopted in a health care setting to improve CR utilization. Join Million Hearts® in reaching the national goal of 70% participation in CR for eligible patients by exploring the ways you can improve your care processes today. Million Hearts® recently launched the Cardiac Rehabilitation Communications Toolkit to equip your organization with resources and messages to spread awareness about the value of CR and solutions for increasing participation. Within the toolkit you will find ready-to-use key messages, downloadable educational materials, sample announcements and social media posts, and more. We hope you will join us in spreading the word about the importance of CR for cardiac patients and helping us achieve our goal of reaching 5 million with our CR messages.